Yesterday Google started rolling out an update to Hangouts that both excited and dismayed many users. The update to Hangouts brought with it the awesome “quick reply” feature already found in the stock Messenger app found on most devices. This feature allows a user to hit a reply button directly from the notification, once they do a small window pops up where they can compose a reply to the message they received. It is awfully convenient and allows you to save a few seconds of browsing through your app drawer, opening the messaging app and then finding the right conversation to reply to. I don’t remember when the feature came to the Messenger app but I haven’t stopped using it since it did. I am excited to use it on Hangouts now! There was a feature hidden in the update that didn’t become apparent right away. Several versions ago Google rolled out what many thought was a game changer, the ability to use Hangouts for both your Hangouts messaging and your SMS (text messaging). It rolled both functions in to one app and a lot of people really enjoyed the new feature. It went from Hangouts being a glorified chat service to being a competitor to Apple’s iMessage app. 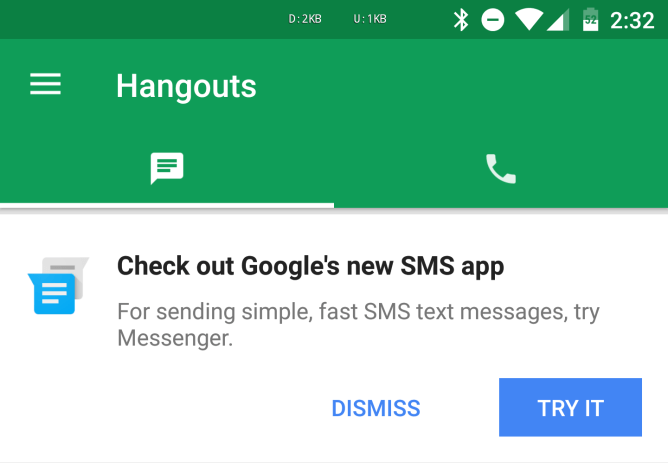 Now Google is doing an about face and encouraging users to stop using Hangouts for their SMS messaging and directing them to use Messenger instead. Personally I am not that bothered with this part of the update as I always had issues using SMS on Hangouts instead of Messenger. I can however see how some people would be upset and not want to split back out in to two different apps. The update comes with a few other minor changes. It includes the ability to create a shortcut to a conversation on your homescreen for quick access. It also includes some minor theming changes to the settings and a few other menus.